VIRGINIA BEACH, VA, (January 21, 2016) – Driving in a winter mix of rain and sleet can turn the roads into a deadly mixture for motorists. 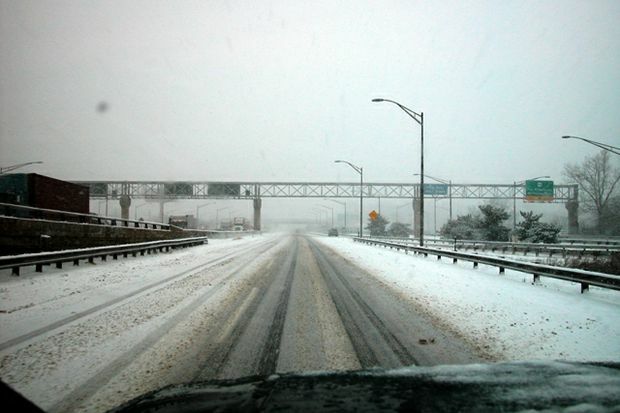 AAA reminds motorists of basic safety tips for driving in wintry conditions. “When driving on snow covered or icy roads, motorists often make the mistake of being overconfident due to the fact that some roadways are clear. This leads to travel at higher than recommended speed when the same driver hits a patch of ice and the results can be devastating,” said Georjeane Blumling, Vice President of Public Affairs for AAA Tidewater Virginia. Buckle up! No matter the weather, be sure everyone’s in seat belts or child restraints. Winter weather driving kits should include a blanket, ice scraper, flares/reflective triangles, flash light (with extra batteries), jumper cables, bag of abrasive material such as cat litter, shovel, cloth or paper towels, first aid kit, bottle of water and cell phone with a full charge. Recovering from a skid without panicking. If you start to skid, stay off the brakes and accelerator and don’t shift gears. Simply look and steer in the direction you want the car to go. When the skid is over you’ll be better able to move the car to a safe spot and calm down before resuming your trip. Never accelerate during a spin. It will only make matters worse. See and be seen. Clear all windows and outside mirrors completely, turn headlights to low beam (even in daylight), and search for hazards farther down the road. Make smooth moves. Slow down, leave plenty of following distance behind the next vehicle - at least six to eight seconds on slippery roads, and leave an “out” to one side. Accelerate, brake and steer slowly and smoothly. Jerky motions increase the risk of skids. Apply Steady Braking. In vehicles without antilock brakes, do not pump the brakes. Keep steady pressure on unless the wheels lock, then ease up on the pedal just enough to regain traction. Remember, rolling wheels have more traction than locked wheels. In vehicles with antilock brake systems, keep pressing the pedal firmly and steadily. The antilock system should handle the rest- do not pump the brakes. Pumping antilock brakes will remove any benefits they provide. Drive in cleared lanes. Changing lanes unnecessarily puts you at greater risk of hitting a patch of ice between lanes that may cause you to lose control of the vehicle. Beware of bridges and overpasses. Bridges, areas under them and overpasses freeze faster than other road surfaces. No cruising. Don’t use cruise control in precipitation and freezing temperatures.